Several Israeli military vehicles invaded, on Thursday at dawn, Deir Abu Mashal village, northwest of the central West Bank city of Ramallah, stormed homes and injured three Palestinians during ensuing clashes. 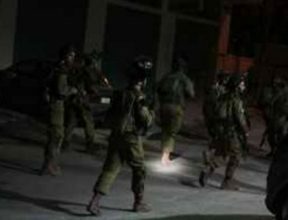 The WAFA Palestinian News Agency said a large military force invaded the village from various directions before the soldiers stormed and violently searched many homes, leading to excessive property damage. WAFA added that owners of some of the invaded homes have been identified as Mohammad Taha, Ibrahim Mohammad Yousef, Yousef Taha and Ibrahim Saleh. The invasion led to clashes between the soldiers and local youths who hurled stones and empty bottles at the army vehicles, while the soldiers fired gas bombs, concussion grenades, and rubber-coated steel bullets. Medical sources said three Palestinians were shot with rubber-coated steel bullets, and many others suffered the effects of tear gas inhalation.